A purported benchmark for the LG Nexus 4 appeared at GLBenchmark this week, showing us some of the dirty details that we were still hoping to get clarification on before the product is unveiled next Monday. First off, you’ll notice that we have a device name of “mako” which has been known as the codename for some time now. Second, you’ll notice the word “occam” in the build fingerprint and product, another name that has been tossed around. In fact, a couple of weeks ago, the tin foil hats came out, and a group of Android enthusiasts jumped to the wild conclusion that there was a better-than-average chance that this was going to be a separate Nexus, probably built by Motorola. You see, because if you Google the term “occam,” you’ll find “Occam’s Razor.” Apparently, that should mean that occam equals RAZR, which equals Motorola phone. Wild, I know. This benchmark, if legit, debunks the hell out of that. 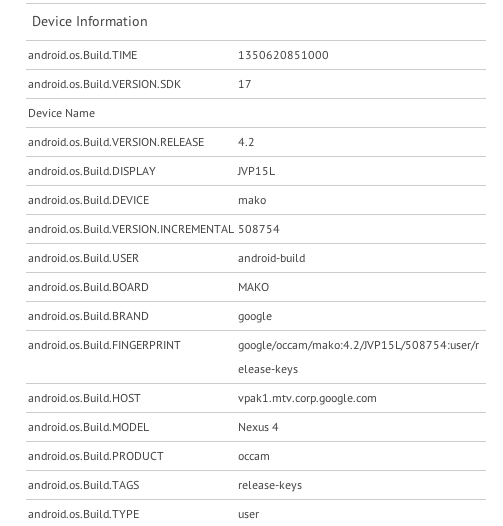 Along with this clarification on codenames, we also see that the device was running Android 4.2 build JVP15L at the time of the benchmark. The screen resolution is 1196×768 (instead of 1280×768), likely because of the on-screen navigation keys that took up space during the benchmark. We can also see that the processor is clocked at 1.5GHz, which matches up to what we have seen the Snapdragon S4 Pro clocked at on other phones. By the way, we should point out that we predicted that the “occam” was the LG Nexus a few weeks back. We also pointed out that the “manta” or rumored 10-inch Nexus tablet, was likely built by Samsung, something that could also come true.